BigCityLib Strikes Back: Ouch! Spring Election Coming? 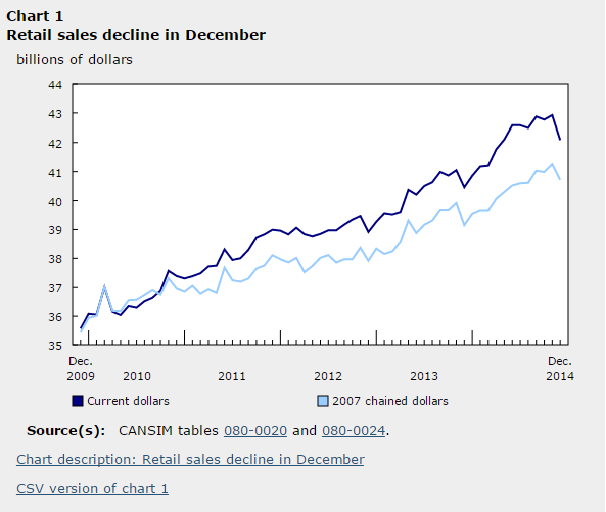 Retail sales fell 2.0% to $42.1 billion in December. This was the largest decline since April 2010. A bad Xmas season means more layoffs at, closures, bankruptcies, and etc. You notice the Harper gov. doesn't talk economics much anymore? You notice how they've switched to Muslim bashing and fear mongering? Look ye above for one of the reasons.